Gov. Michael J. Dunleavy’s plan for repaying permanent fund dividends over the next three years (while also paying out dividends under the historical formula) didn’t land particularly well with senators during its first hearing in front of the Senate State Affairs Committee. The presentation gave a 10-year outlook on what the additional payments would do dividends in the long term (they’d still be in the $3,000 range, but about $100 smaller) and increase the risk that the Permanent Fund Dividend’s earnings reserve account, which is the accessible $16.6 billion portion of the $60.4 Alaska Permanent Fund, could be run down to zero. Legislators pointed out that the 10-year analysis was too short (particularly when the numbers seemed to be getting worrisome right at that mark) and requested some analysis further into the future. With the state’s percent of market value (POMV) restructuring of the Alaska Permanent Fund looking at making roughly $3 billion structured draws each year and the cost of the repayment ranging from $600 million to $800 million each year, Senators balked at the price tag. Of all people, it was Sen. Lora Reinbold, R-Eagle River, who mostly clearly voiced her discomfort with spending down the Alaska Permanent Fund. The state countered that the Permanent Fund still generates money during that time, but acknowledged that there is additional risk in making draws outside of the rules set by the restructuring of the fund. Sen. Peter Micciche, R-Soldotna, said he was worried the Legislature would make a habit out of making unstructured draws out of the Alaska Permanent Fund thanks to the near-depletion of the Constitutional Budget Reserve. Economist Ed King, who was presenting the bill to the committee, acknowledged the increased risk, but said it was within the governor’s acceptable range. He noted, however, that if the Legislature wanted to try to make additional draws from the Earnings Reserve Account—even as low as $500 million—there was “severe” risk of depleting the account. 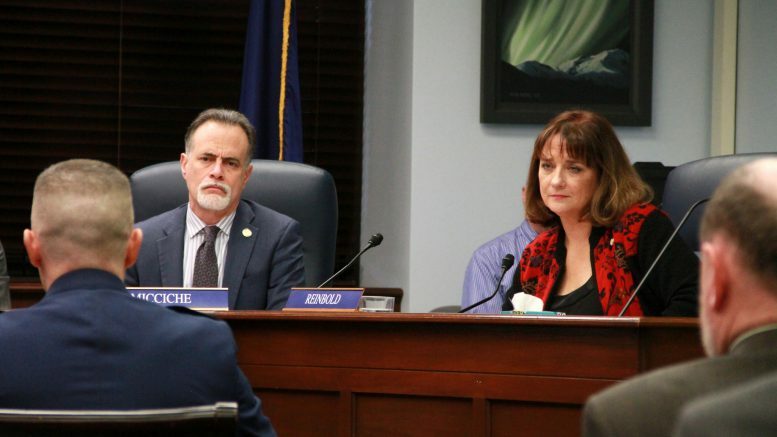 It’s becoming crystal clear that the Legislature will not rubber stamp Dunleavy’s promise for repaying dividends, and there’s doubt that they’ll sign off on a dividend payment under the old formula. After all, about $1 billion of the $1.6 billion deficit is caused by Dunleavy’s campaign promise to return dividends to the historical formula. It’ll be interesting to see what kind of amendments are offered when the legislation is back up in front of the committee next week. There’s still certainly going to be a faction of legislators who will push for a payback plan all in three years. The Senate also changed up committees on Tuesday morning. Sen. Click Bishop, R-Fairbanks, was relieved from duty on the Senate Health and Social Services Committee after he requested the change because of the existing workload of holding a seat on the Senate Finance Committee and the chairmanship of the Senate State Affairs Committee. Senate President Cathy Giessel will take his position on the committee, adding a female senator to what was an all-male committee. Alaska’s Board of Education voted earlier this week to give the University of Alaska Anchorage’s education students a break and accept their unaccredited degrees as acceptable for teaching in Alaska. It, of course, comes at a time that the Legislature is digging into the university’s budget. There weren’t any clear answers during the Senate Subfinance Committee meeting on the UA budget Tuesday about what the loss of accreditation might mean for the university’s budget, which will almost assuredly be cut in the budget proposed by Gov. Michael J. Dunleavy next week. Legislative staff pointed out that understanding the potential impacts the budget will have on the university will be tricky because the state only allocates a lump sum to the university and spending decisions are directed by the Board of Regents. During the House meeting on crime. 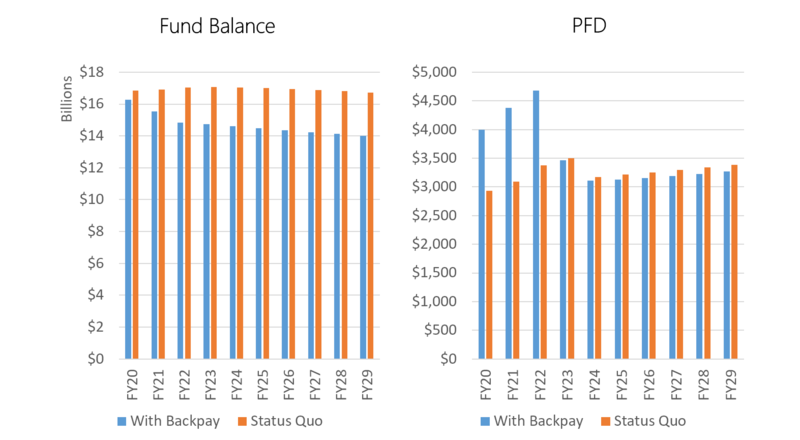 Be the first to comment on "AKLEG Day 22: Senators bristle at long-term risks of Dunleavy’s PFD repayment plan"